With its abundant history of prominent families, Massachusetts boasts some of the most historically rich residences in the country. In the eastern half of the Commonwealth, these include Presidents John and John Quincy Adams's home in Quincy, Bronson and Louisa May Alcott's Orchard House in Concord, the Charles Bulfinch -- designed Harrison Gray Otis House in Boston, and Edward Gorey's Elephant House in Yarmouth Port. 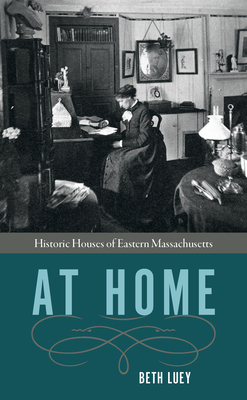 In At Home: Historic Houses of Eastern Massachusetts, Beth Luey uses architectural and genealogical texts, wills, correspondences, and diaries to craft delightful narratives of these notable abodes and the people who variously built, acquired, or renovated them. Filled with vivid details and fresh perspectives that will surprise even the most knowledgeable aficionados, each chapter is short enough to serve as an introduction for a visit to its house. All the homes are open to the public. Beth Luey is author of House Stories: The Meanings of Home in a New England Town.